Can Growing Diatoms in the Oceans Reverse Climate Change? The world’s largest life-giving habitat on earth is terminally ill.
Our world ecosystems depend on the ocean to sustain all of life on earth, yet we are not doing enough as a global community to prevent the ocean’s catastrophic decline. In this article, learn why Nualgi is the only natural ocean fertilization solution that will reverse global warming, increase atmospheric oxygen, decrease algae blooms, and replenish our dying population of fish, whales, birds, and, subsequently, all other life on earth! We cannot continue to waste time applying band-aids if we want to really make an impact. With Nualgi, there is true hope for large-scale success and global sustainability to restore the earth’s balance. Not only is Nualgi the only effective method to revive oceans, it is also the most cost effective method to improve both aquatic and land based ecosystems. Please inform yourself of how this detailed, scientific process works to spread the word. We need to act immediately and on a grand scale in 2017 to begin this process before it’s too late! We recognize the immediate need to reverse damage done to our environment. If you are also in the mission to find a natural approach to this growing problem, please contact us to learn more about Nualgi Lakes. What’s the Big Problem? The Ocean Looks Fine to me…. Maybe you cannot see all of the negative effects of global warming in your daily life, especially if you do not live near an ocean community. Here’s an overview of the combination of problems that we are facing with ocean decline today. Crash Course: What’s the Problem Nualgi Solves? Oxygen is declining in water as carbon is heating up the oceans. The ocean produces at least half of the oxygen on the planet. Phytoplankton are the most important oxygen producing organisms in the ocean and they are also at the very bottom of the marine food chain. These single celled organisms produce dissolved oxygen in the water by combining energy from the sun and nutrients (naturally things like fish poop and unnatural things like pollution) from the water. There is now an excess of nutrients and carbon dioxide in the ocean but not enough phytoplankton to keep up with all this nonsense! Nualgi is made of nutrients engineered for diatoms' exclusive consumption. Diatoms consume the extra nutrients in the water (competing with algae) while providing a nutritional food source to these precious phytoplankton. More phytoplankton = more oxygen, more fish, more whales, more birds, less pollution, less carbon, healthier earth, healthier humans! The Great Barrier Reef is Endangered - In 2015 the National Oceanographic Atmospheric Administration issued a warning stating that the world was undergoing a global reef bleaching event. In 1998 and 2002, roughly 10 percent of the reef surveyed had severe bleaching. But in 2016, only 10 percent of the reef remained unbleached. Green House gas (GHG) emissions - caused by human activity are high and increasing. This carbon dioxide excess is caused by pollution, cars, factories, etc. Methane Release from Artic - NASA has identified Methane release, due to rising temperatures in the Arctic, as a significant risk to the planet. Sea Temperatures Rise - Green house gases cause temperatures on the planet to rise, causing ice caps to melt. Ocean Oxygen Decline - when there is more carbon added to the earth at this level, the natural cleaning crew (phytoplankton, plants) cannot keep up. Largest Ever Toxic Algae Blooms - Too many pollutants create imbalances and excess such as overproduction of toxic algae, causing death to living things. Fish Population Declines - If there are less phytoplankton at the bottom of the food chain then it follows that everything else will decline as well. 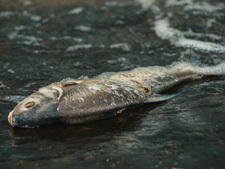 Toxic algae, pollution, and over farming of fish is expediting this decline of fish. Today there are about 812 to 2050 Million tons of fish left in the oceans compared to 7,000 to 15,000 million tons estimated only two centuries ago. Blue Whales Endangered - from 275,000 over 100 years ago to about 2,500 at present. These guys play a huge part in ocean fertilization by acting as “mixers” bringing nutrients from the deep ocean to the surface. Our hypothesis is that decimation of the whales has reduced recycling of Iron and this may have lead to a decline in diatoms in the Oceans. By now you may be wondering… this is horrible, what do we do? There have been suggestions that fertilizing the oceans with iron may help phytoplankton growth. The problem with this solution that it is not natural and it is not sustainable. Iron is required by all living organisms from bacteria to humans. Iron fertilization is when humans replicate what the ocean should be doing by itself - bringing nutrients from the bottom of the ocean to the top. When Iron is dosed in the form of Iron Sulfate or Hematite ore it is consumed by and causes growth of many organisms including phytoplankton. Iron fertilization works to increase the phytoplankton population, but it doesn’t not offer a sustainable solution to maintain the ecosystem like Nualgi does. To increase fish stocks and photosynthesis in the oceans, Iron Fertilization experiments have been carried out. Between 1993 and 2009, there were 12 Iron Fertilization experiments conducted and studies cited below in this article. Experts agree that it is better to grow diatoms in preference to other organisms to revive the marine habitat and reduce carbon. These experiments enhanced biological productivity to increase carbon dioxide removal from the atmosphere. Iron is often the limiting nutrient to phytoplankton growth and is a trace element necessary for photosynthesis in all plants. Large phytoplankton blooms can also be created by supplying iron to iron-deficient ocean water. Iron fertilization occurs naturally when upwellings bring nutrient-rich water to the surface, from whales, or when the ocean currents meet an ocean bank. This type of natural fertilization produces the world’s largest marine habitats! Prof John Martin had proposed the Iron Hypothesis in 1988, he suggested dosing Iron in silicic acid rich areas of the oceans, such as the Southern Ocean to grow mainly Diatom Algae. However, dosing iron normally available in the market, such as Iron Sulfate or Hematite Ore does not guarantee Diatom growth. Further Prof Martin had not suggested Iron fertilization of fresh water lakes and rivers, so no one tried this out. We have been fertilizing ponds, lakes, etc., with Nualgi for over 10 years, with excellent results. We get very consistent growth of Diatoms and water quality improves. What is Iron Fertilization in the Ocean and How Does it Work? Iron is required by all living organisms from bacteria to humans. When Iron is dosed in the form of Iron Sulfate or Hematite ore it is consumed by and causes growth of many organisms including phytoplankton. Large phytoplankton blooms can also be created by supplying iron to iron-deficient ocean water. Iron fertilization occurs naturally when upwellings bring nutrient-rich water to the surface or when the ocean currents meet an ocean bank. Source: Strong, A.L., Cullen, J.J. & Chisholm, S.W. (2009). Ocean Fertlization, Science, Policy, and Commerce, Oceanography, Vol. 22, No. 3, pp. 236-261. The solubility pump (right) and the biological pump (left) help to maintain a sharp gradient of CO2 between the atmosphere and the deep oceans where 38 x 1018 G of carbon is stored. Using sunlight for energy and dissolved inorganic nutrients, phytoplankton convert CO2 to organic carbon, which forms the base of the marine food web. As the carbon passes through consumers in surface waters, most of it is converted back to CO2 and released to the atmosphere. But some [of it] finds it’s way to the deep ocean where it is remineralized back to CO2 by bacteria. The net result is transport of CO2 from the atmosphere to the deep ocean, where it stays, on average, for roughly 1000 years. The food web’s structure and the relative abundance of species influences how much CO2 will be pumped to the deep ocean. This structure is dictated largely by the availability of inorganic nutrients such as nitrogen, phosphorus, silicon and iron. Research will confirm that Green House gas (GHG) emissions caused by human activity are high and increasing. Here’s the solution. Use the Nualgi ingredients of phosphorus, silicon, iron and 10 other nutrients and micronutrients to nourish diatoms that feed the the phytoplankton. If we can feed the bottom-most part of the marine food chain, we can rebuild it from the ground up! There are today about 812 to 2050 Million tons of fish left in the oceans compared to 7,000 to 15,000 million tons estimated only two centuries ago. Current fish stock produces 110 million tons of Calcium carbonate annually. Calcium carbonate minerals are the building blocks for the skeletons and shells of many marine organisms. Continued ocean acidification is causing many parts of the ocean to become undersaturated with these minerals, which is likely to affect the ability of organisms to produce and maintain their shells. Current fish stock produces 110 million tons of Calcium carbonate annually. If we were to increase levels to the same as two centuries ago, by re-populating the Ocean with fish and improved carbon sequestration, we would then increase the production of Calcium Carbonates by a factor of 10 to 14. Carbon sequestration removes carbon dioxide from the atmosphere and instead holds it in solid or liquid form. Thus reducing C02 emissions! That's an additional 1000 to 1400 million tons of carbon sequestration capability. Carbon dioxide CO2, Methane CH4, Nitrous Oxide N2O, are some of the GHGs. Methane is about 20 times and Nitrous Oxide is about 300 times more harmful than CO2. Anthropogenic CO2 emissions are about 10 Billion tons of Carbon per year. Calcium carbonate is an important part of the ocean’s lifecycle and an area where we have the power to improve levels with a natural solution. 1 liter of Nualgi can cause growth of up to 1,000 kgs of Diatoms. 1,000 kgs of Diatoms require about 100 kgs of Silica, obviously 1 liter of Nualgi does not contain 100 kgs of silica. Silica is used only to ensure that the Iron and micronutrients are consumed by Diatoms and not by other phytoplankton. Since only Diatoms require silica, they consume Nualgi and thus the Iron and other micronutrients in Nualgi are delivered to Diatoms in a large waterway with a large number of various organisms. Silica keeps Iron and other metals stable in water and prevents them from oxidizing. Thus the problems with use of Iron in other forms such as Iron Sulfate or Hematite Ore are solved by Nualgi. Growing diatoms would be beneficial to restore marine life and not just to sequester carbon due to dead diatoms sinking to ocean floor. Diatoms are beneficial - dead or alive. Is Nualgi Lakes a Safe Alternative to Iron Sulfate Fertilization? Nualgi has safely been used in home aquariums, backyard ponds, and pollution management in India. Accounting for 10+ years of testimonials across the world! Iron Sulfate rusts, while Nualgi Lakes is a powder in suspension, the metals are suspended in water, and has a remarkable shelf life of 3 years. Iron sulfate powder causes problems to those using it and they have to wear protective clothing and masks. No such precautions are required while using Nualgi. Iron Sulfate is not intended for diatom growth. Nualgi is specifically invented to achieve Diatom growth and has been proven over the past 10 years. Dosage of Iron Sulfate is mentioned at 10 tonnes in 300 km2 which is about 10,000 kgs in 30,000 hectares, 1 kg per 3 hectares. Nualgi dosage is 1 liter per hectare which is quite comparable. Now is the time to make a difference for our planet and ocean fertilization is a very promising opportunity for restoring the natural balance of our ecosystem. We are confident that Nualgi Lakes has amazing potential to solve this global problem and past research further supports our hypothesis of our safe solution to combat harmful algal blooms. You Can Use Nualgi To Restore Ocean Life Through Diatom Growth! Our hypothesis is that decimation of the whales has reduced recycling of Iron and this may have lead to a decline in Diatoms in the Oceans. Sadly, Blue Whales have declined from 275,000 over 100 years ago to about 5,000 at present. After 10+ years of research in large waterways and small aquariums, we are confident that Nualgi Lakes is the breakthrough product that can revolutionize the way we look at ocean fertilization to improve our global ecosystem. Please contact us with any and all questions related to this topic. Thanks for your interest. Welcome To The Clean Water Blog! Learn more about how you can naturally improve water quality, dissolved oxygen content, reduce costs through a natural approach.